Can robots be trained to pick up objects they've never seen before? Recent research indicates that the best approach may be to allow robots to experiment on their own, and then share that knowledge with other robots. Until now, robots were programmed to recognize specific objects and to relate to those objects in a pre-programmed fashion. This is a good approach for predictable tasks, in planned locations, with previously experienced objects. In the real world, life is what happens while you’re making other plans. At Google, Sergey Levine and his team took fourteen robotic arms, networked them together, and used (CNN) convolutional neural networks to let these robots learn on their own how to pick up small objects including a cup, tape dispenser, and a toy dolphin. 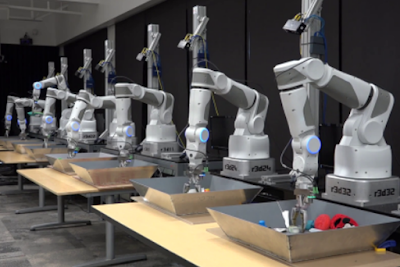 Over time, and nearly one million practice runs, the robots were able to self-correct and optimize their actions. They learned to pick up objects faster and more often, employing self-taught strategies - such as pushing an object away in order to reach another, and developed different techniques to pick up soft versus hard objects. The robots learned from practice and sharing knowledge with one another, and without human interaction or pre-programming. In fact, the only human contribution was to replace the objects in the trays. During the study, the robots were positioned in front of trays with randomly placed objects varying in shape, scale, weight and hardness. Each of the 14 robot arms had a similar, but not identical design. Each robot’s successes and failures were fed to a shared convoluted neural network, a “robo-wiki” of shared knowledge accessible to the 14 robots. Google’s project builds on the concept that robots can teach other robots how to perform specific tasks—or, more accurately, how one artificial intelligence can help another AI improve, without a human ever intervening. The robots taught each other to pick up hard and soft objects in different ways, without human guidance. For an object that was perceived as rigid the robots would just grasp the outer edges and squeeze to hold it tightly. But for a soft object, like a sponge or the dolphin, the robots "learned" that it was easier to place one gripping "finger" in the middle and one around the edge, and then just squeeze. The good news -- the Robots still needed humans to place objects in the trays. A Brown University project called “RoboBrain,” plans to store all machine-learned behaviors into a knowledge database which other bots can tap into. The project has been nicknamed “the world’s first knowledge engine for robots.” Some people call in "SkyNet." Robo Brain is a large-scale computational system that learns from publicly available Internet resources, computer simulations, and real-life robot trials. It accumulates everything robotics into a comprehensive and interconnected knowledge base. Applications include prototyping for robotics research, household robots, and self-driving cars. The Claw Is Our Master: He chooses who will go and who will stay. Regarding robots walking into a bar... you would think that 14 robots using convolutional neural networks would be great at telling jokes. They're not. More on robots, AI and humor, here: It's hard work being funny--especially for robots. Click this link for more information regarding Deep Learning and Convoluted Neural Networks.